So you have your beautiful set of pencils with two hundred colors, but you never seem to have quite the right shade! And to use colored pencils realistically you need to be able to get different shades. You can't pop a bit of one color on a palette, add another and mix away. So what do you do? Technically, when we 'mix' colored pencil, we are not really mixing at all, but creating an optical illusion. Through layering colour we trick our eyes into seeing something that isn't really there. The only way to change the colour of our colored pencils is by layering, one color on top of another, sometimes many layers of different colors. The hard part, especially when we begin with colored pencil is knowing which colors to layer and even the order that we layer them can make a subtle difference to the final result. If you are so inclined you can read whole pages of color theory and go into discussions of hues and values and tones. The intention of all my tips and techniques for using coloured pencils is to keep them simple. I want everyone to know that art is not complicated, it is not for a 'gifted' few. We can all create great art with practise and a few simple tips. The simplest way of finding which colors to layer in which order is to keep a piece of scrap paper (the same as the paper you are working on because it can alter the colors a bit) and just try one color over another until you get the shade that you want. But this can be very time consuming. There are two little inexpensive items that I have found invaluable, especially at the beginning. 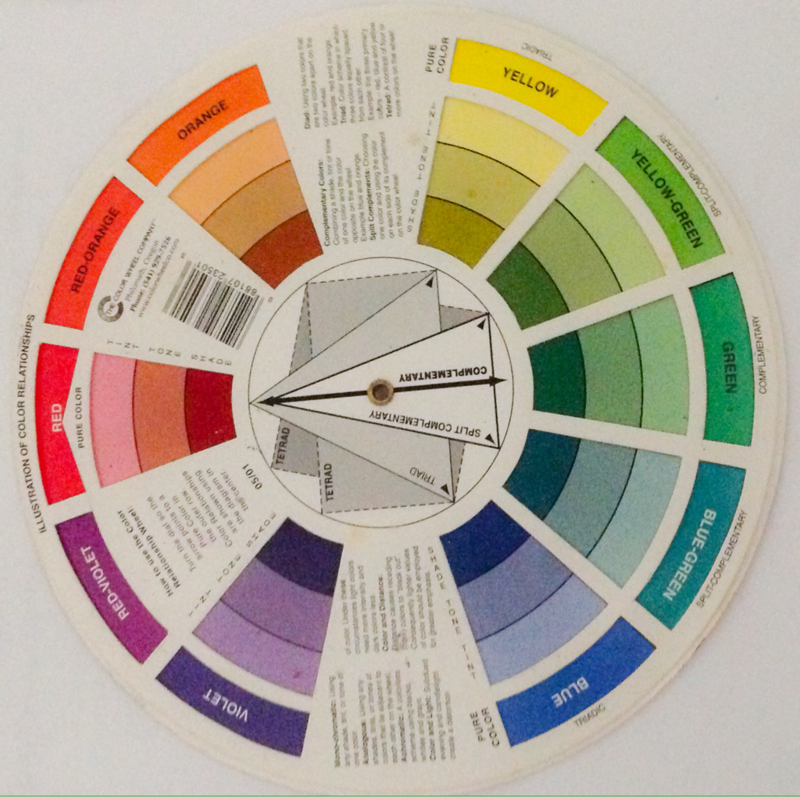 The first is a color wheel like the one below. This is very useful when you have a colour that is a shade or two brighter or darker than you want. Pick the color on the wheel closest to the pencil you have, then simply use the shade on either side of that colour to brighten or darken it. So let us say you have a red pencil and you would like a slightly darker shade of red, we see that red violet is exactly next to red, so if we layer a little red violet (or our closest shade of pencil) over our red, we will darken it a little. Or if we want our red a little brighter we could layer a little orange red over it, the color on the other side of red. If we really want to go a lot deeper in colour, or perhaps create shadow we could use the color that is opposite on the color wheel, in this case, green. This often gives a nicer result than simply layering grey or brown over our color. The other side of the wheel shows what happens when you add different colours or black and white to a color. 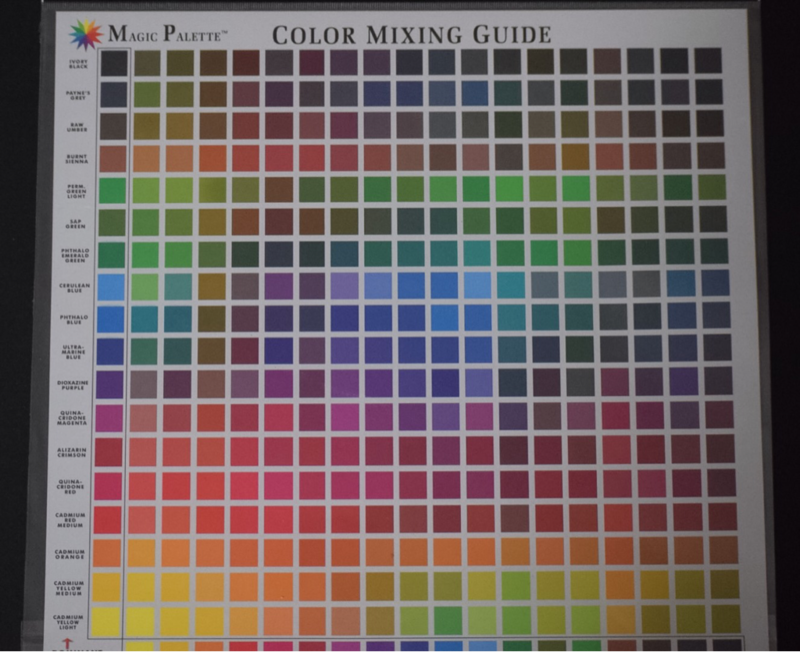 The other inexpensive but very useful little tool is a color mixing guide like the one below. The aim of this page is really to say, do not get bogged down trying to find the exact, perfect color, unless you really, really enjoy doing that. Close is all you really need, and I will say it again, art should be fun. Love what you do and that will reflect in your work. Color will happen quite naturally the more that you draw.